I had big plans to annotate all the weekend's photos, crop and adjust brightness and blah blah blah. We all know what happens to the best laid plans, of course, and thus WITIWYG (What I Took Is What You Get). Those of you who took hundreds of photos this weekend, you have my sympathy. My Spring Fling flickr collection is here. If you also flickr (hmm, that doesn't sound right), feel free to add me (bintie) as a contact! Looks rather different, doesn't it? Note how much the "shoulder" hedge has grown; we were skeptical when the concept was explained to us back then, but it really has filled in. Also note the whole new skyscraper, the Trump Tower, just completed a few months ago. I'll highlight a handful of photos in coming days and share some of my favorite sights from the weekend! Now I need to go get some sleep; big week of DNA sequencing ahead of me. Keep an eye out for those basswoods! Well, now I understand why I was having trouble finding your blog! I'm so glad I finally made it here to discover that you are a fellow hound person. It was great to meet you, though we had so little time to talk. At least we can always meet up sometime over the summer. I had to skip the Lincoln Park lily pond, and the photos I've seen of it look great, so I'm planning to go there sometime soon. Those salvias were so beautiful--great shot, Diane. I enjoyed meeting you and all the other bloggers I didn't get to meet last year. I did take hundreds of photos, and since I just got home from Chicago I'd better get cracking on winnowing them down to the post-worthy ones. Until Spring Fling next year! Hi Diane, it was a pleasure meeting you at SF - wish we'd had more time to visit. Now that SF is over, I'm looking forward to having more time for blog visits and returning to my normally peaceful, quiet life! Diane, I enjoyed meeting you and getting a chance to talk on the bus--now I will be looking for basswoods everywhere I go! It's been fun getting to visit a few of the bloggers (it will take me a week to get to all!) who attended Spring Fling and seeing their different perspectives on the weekend. 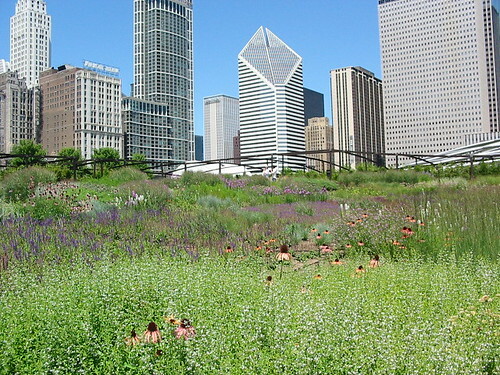 I think most of us so far have shown the river of salvia at Lurie, but I love your "before" picture! It's a good reminder to all of us that we must be patient with our gardens. Good luck with your DNA! Diane, it was such a treat to get a chance to talk to you on the bus. Your story is a very interesting one. :) The before and after shots of the Lurie are delightful. Make you appreciate the garden that much more. Will be out there looking for bass wood for sure now! I wondered what it looked like during other times of the summer. I am glad you posted this. It certainly looks more natural. I was sort of overwhelmed by all the photos I took. I rarely ever "fix" mine. You usually get what I take. 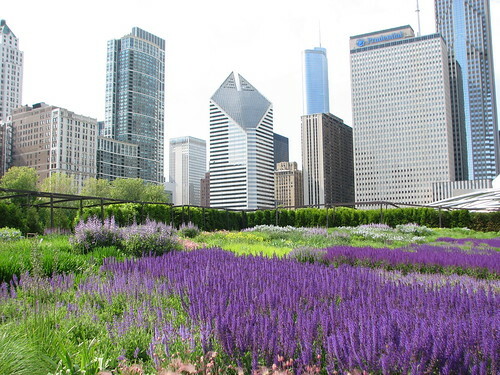 May: Spring Fling Chicago - last day!